"If someone comes to give you a gift and you do not receive it, to whom does the gift belong?" There’s no need to respond to every insult, every jibe at all. In fact, there is no need to say something to counter whatever someone has said at all. However, if you think you are not evolved enough, and therefore are unable to be forgiving, the least you can do is to avoid responding, retaliating and getting even with everything that someone has to say. These conflicts happen endlessly, each day. Someone shows you his middle finger on the road. An impudent teen scowls at you because you questioned why she jumped the queue you were waiting in. A neighbor accuses you of violating their privacy last night because you had guests over and the music volume was higher than usual. An irate boss says you are not performing as well as you should be. Some of these events may have happened even though you did not contribute to or cause them. Which makes it often all the more difficult to handle. Your initial sense of shock fades into anger and you want to ‘get even’. And then one thing leads to another. Pretty soon, you are either sulking or fuming. So, the simple takeaway is, don’t accept gifts__of insults and rebuke__that you don’t want! 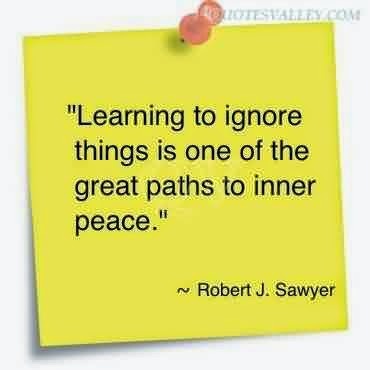 Just walk away….mindfully, peacefully…. Author AVIS ViswanathanPosted on March 17, 2015 March 14, 2016 Categories Art of Living, Happiness, Ignore, Inner Peace, Insults, Intelligent Living, Mindul, Peaceful, ZenLeave a comment on "If someone comes to give you a gift and you do not receive it, to whom does the gift belong?" 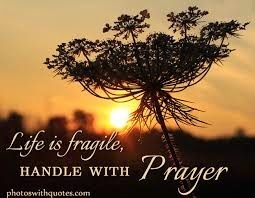 Make your Life your prayer. And you will be soaked in peace. The popular notion that we have, thanks to our upbringing and conditioning, is that prayer is an action that requires a time, a place and certain necessary and sufficient conditions. Each religion preaches worship through prayer differently. Therefore, while all of us have become adept at prayer, and praying, we have become completely incapable of living our lives meaningfully! Even when in prayer, the mind is distracted, often anxious, fearful and disturbed! How can merely, mechanically, by rote, chanting a mantra or reciting a hymn, compensate for intelligent living? This is my humble, personal view. Over the years, I have learned that your entire Life, the way you live, think and work, can be prayer if you understand that this lifetime is a gift and that you must forever be grateful to Life for this experience! Choosing forgiveness over angst, love over hatred, postponing worrying than postponing happiness, serving others over seeking deservance for yourself, practising gratitude over harboring expectations and making each moment count are all ways in which you can live your Life prayerfully. When you do this, repeatedly, over days and months and years, you become the peace that you seek. This doesn’t mean that Life will not serve you any more problems. Problems – perhaps even complex ones – will always be there. But you will be able to deal with each of them effectively and efficiently, because you are now anchored in peace. It is only because you relegate peace and prayer to a specific time, and do it with a ritualistic obsession and not with soulful fervor, that you are unable to escape fear, worry, anxiety, guilt, grief and suffering. But if you make your Life your prayer, always being grateful for all that you have, you will always be at peace – with yourself and your world! 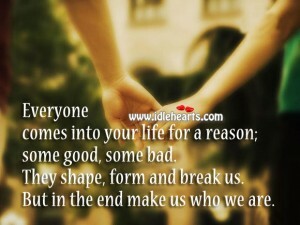 Everyone comes into your Life with a reason. They may not always be the most welcome influences in your Life when they do arrive. But they are there to teach you something__provided you are open to learn your lessons from them! Some years ago, a marquee client’s manager had an intense dislike for me personally. My Firm was a service provider for his company for over 8 years at that time. Over this time, his company’s founder and CEO and I had established a remarkable personal rapport and professional, working relationship. When he came on board, his boss, the CEO asked him to take all “direction and support” from me in managing ongoing corporate affairs, executing pending assignments and formulating new strategies for their company. Maybe it was the word “direction” that his boss used which ticked off the manager. Maybe it was hands-on my working style. Whatever it was, from day one, he made his dislike for me known explicitly. He began by barring me from meeting the CEO one-on-one. He set in place a ridiculous process of recording deviations for the flimsiest of reasons__ranging from delays in arriving for meetings called with no notice or inability to manage delivery by other partners, who were independent vendors or service providers to his company, just as we were. For the record, our job did not include managing their delivery, though their delivery did impact our work! For each deviation he so recorded, he enforced a financial penalty, which were not envisaged per our Service Legal Agreement with his company. Over a few months, it became clear that his actions were driven by an agenda to cause me personal grief. He was, at the same, extremely courteous with my other team members who were co-owning his company’s engagement alongside me. For whatever reason, perhaps misplaced righteousness, I refused to seek an engagement review with the CEO. Instead, I sat down to do a review of how we were working as a Firm__what value we were delivering and how happy we were doing what we were mandated to do by our clients. This manager’s actions, the ignominy and suffering that followed, forced me to rethink every single aspect of our Firm’s portfolio of services, our delivery model, our client-wise billings and profitability. To our surprise, though it should never have been surprising, we discovered that our entire service strategy was flawed. Every client relationship was unprofitable. We were bleeding__billing our clients far, far less than what it cost us to deliver them the unmatched service that we always did. When we looked at the numbers, in the backdrop of our already debt-laden balance sheet, we realized we were going nowhere from a business point of view. On the other hand, I was also personally not happy with delivering the services we were offering clients. This realization led to a complete retooling of our services, our delivery model and our client portfolio. It included, of course, exiting non-profitable client relationships, beginning with this marquee client. This led to a virtual reinvention of our Firm. A version 2.0 is you like! Over the years, we have built a simpler delivery model that creates exceptional value for our clients, gives us immense joy in delivering it, and which is financially profitable too. Our legacy problems remain, but we don’t make losses with our client relationships anymore. When I look back, I realize that the antagonistic manager’s presence in my Life was key to my transformation as a businessman, a professional and as an individual. That he was indeed there with a reason. He has since moved to live in the United States. While visiting there a couple of years ago, I called him up and profusely thanked him for helping me along, perhaps unwittingly, my Life’s journey. He gracefully welcomed my gesture to reach out. Whenever I think of how far I have come in Life, I always say a silent prayer of gratitude to that manager. Without him, I realize, I wouldn’t be the way I am today __ happy and peaceful__despite the circumstances! If you have someone in your Life right now, whose presence you question or whose influence you resist, sit back and look at this person differently. Ask yourself what you can learn from this person. You will then realize that she or he is there with a reason!